We all know that sunscreen is oh-so-vital for avoiding wrinkles, and even more importantly, reducing the risk of skin cancer. And while some of us may be religious in our use of sunscreen, chances are we are still doing it wrong.Yep. Doing it wrong. Shocking, right? Well, what is even more surprising are these sunscreen facts that I bet some of you may have never heard. 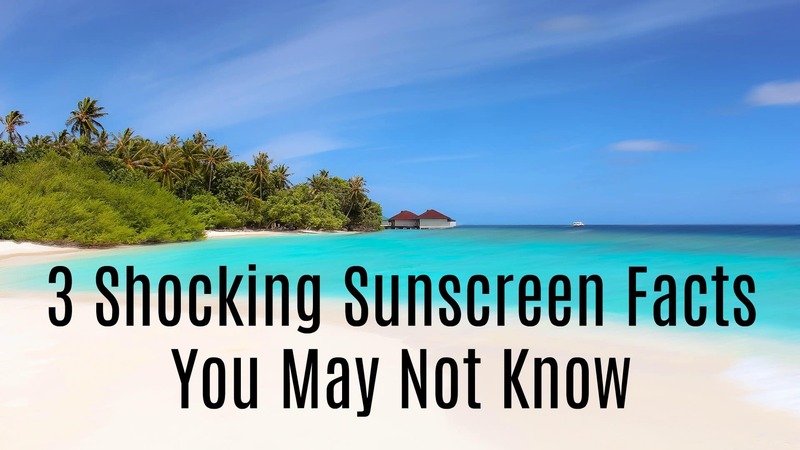 So sit back, relax, and let me school you with these 3 shocking sunscreen facts. Let’s be honest. How many of you apply sunscreen before running your everyday errands? Probably not many of you, in fact I didn’t even think to apply sunscreen before running out to get my mail. But it turns out that these quick little errands actually add up to over 80% of our overall sun exposure throughout our lives. That means your short walk to your car, running down to the corner store, walking the dog, picking your child up from school, or walking in and out of stores are each contributing to your skin getting blasted by harmful UV rays. And if you are doing each of these errands without proper SPF protection, well you can be sure your indulgent day at the beach has got nothing on your everyday life. So to avoid early signs of aging, annoying wrinkles, and risk of skin cancer lather up with sunscreen before ever stepping foot out your door. But how much sunscreen should one use? Even if you are a diligent sunblock user, you still may be doing it wrong. In fact, most of us who apply sunscreen are doing it wrong. And why is that? Because we don’t use enough. Studies have shown that you should be applying 2 tablespoons of sunscreen to your body, and at least half a teaspoon of sunscreen to your face to ensure your skin is properly protected. And while I understand that sounds like a lot of sunscreen, if you let your skin absorb it you should be able to easily apply a second layer. This way, if you apply the correct amount, you can enjoy your time having fun in the sun without worrying about the harm you are causing your skin. This fact really blew my mind as I always believed if I was spending the day out in the sun and applying my sunscreen twice throughout the day, I would be covered. Actually, experts state that you should be applying your sunscreen at least every two hours! And what is even more shocking is that this stat remains true whether you are spending the entire day outside, or are just getting incidental sun exposure. That means, even if you are sitting inside for most of the day but need to go out once in the morning and once in the afternoon, you have to reapply your sunscreen to make sure you are properly guarded against damaging UV rays. All I can say is, oops. Whether you are a sunbaker or a sunblocker, it is essential that you lather up, and lather up often with broad spectrum sunblock to ensure you steer clear of wrinkles, and the risk of skin cancer, for as long as humanly possible. After all, the tanned, sagging, leathery skin look isn’t exactly the best look for us ladies. So make sure you take the proper precautions so you can live your best life, much later into your life. Vanessa is a lifestyle blogging babe whose work can be found on websites all around cyberland, including reviews on the best teeth whitening products. The best part about her job? She gets to help her readers look and feel their very best. You know what I love about Fridays? I think the most important thing to know about sunscreen is that you have to constantly reapply it for the best protection! I apply to my face in the morning. But rarly re-apply unless going to the park or pool.